This is a follow-up to the previous post about the FFCS Confrence. So often we feel alone as former Christian Scientists. 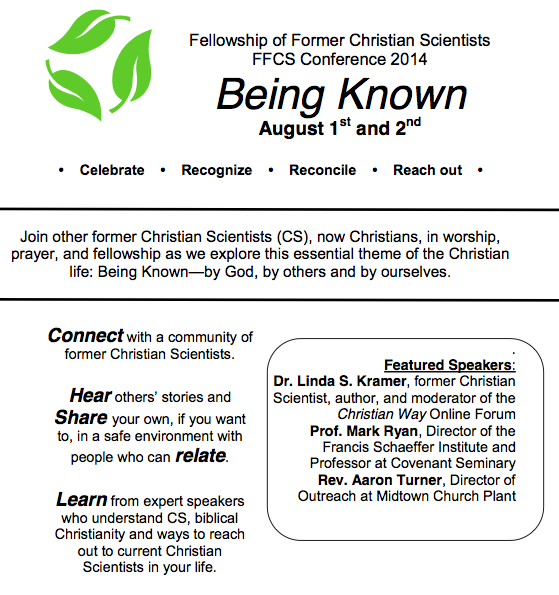 Now is a time for “Being Known.” We hope you can join us for the first Fellowship of Former Christian Scientists (FFCS) Conference on Aug 1st and 2nd. Please spread the word to other former CS, too. Fill out the attached registration form and send it in today! Early registration ends next week on July 18th. Come make connections with other former CS and share your testimony, if you want. Come celebrate our freedom from CS and our new faith in Christ, recognize the pain from our past in CS, and learn about some tools for recovery as we reconcile and reach out. FFCS Conference 2014 Schedule: All events will be held at Grace and Peace Fellowship (5574 Delmar St. Louis, MO 63112). All meals during the conference are included in the conference fee. Saturday dinner on your own. (We’ll have a group going out together if you’re interested.) You are welcome to join us for worship at Grace and Peace Fellowship on Sunday, Aug. 3rd from 10:30AM-12PM as well. If you are coming from out of town we’d love to help as much as possible. Please see the attached information about local hotels. 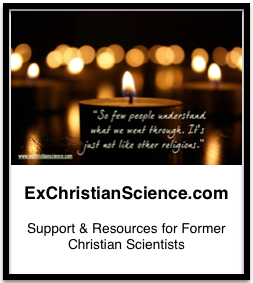 Who: Former Christian Scientists, now Christians, who are seeking community and resources for recovery and outreach. Where: Grace and Peace Fellowship, 5574 Delmar Blvd., St. Louis, MO 63112. When: Friday evening, Aug. 1st and all day Saturday, Aug 2nd. We would also love to have you join us for Sunday worship at 10:30am.